Virtual Machine - you can install Windows in a virtual machine using VMware or similar software. This method provides the best compatibility, but you will have to run a copy of Windows in the background. 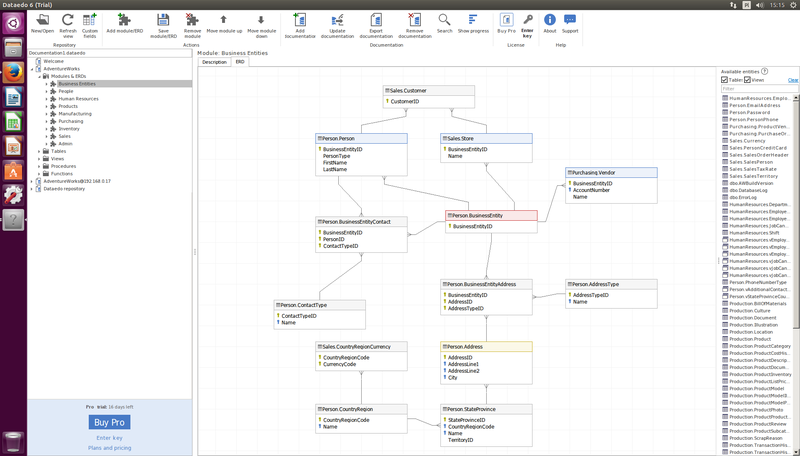 Wine - Wine is a compatibility layer that allows running Windows applications on Linux by mapping api calls to Linux equivalents. Note that Wine is Not an Emulator and it won’t allow running Dataedo on architectures that are not natively supported (other than i386 and x64). Dataedo 32 bit has been tested and runs reasonably well on Wine, however installation requires some tricks. Dataedo 64 bit likely won’t work as long as .NET 4 is only installable in 32-bit wine prefixes. Wine version 2.0. We have tested older Wine (1.6) and Dataedo was unstable. 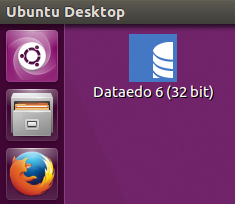 In our example we will show how to install Dataedo on 32 bit Ubuntu Linux. Download and install Wine 2.0 - we followed instructions from https://www.winehq.org/download, as it has download packages for major linux distributions. Install Mono and Gecko when prompted. Next you will have to install .NET Framework 4.0 on Wine. The easiest method is to use the winetricks script. If prompted, download gacutil and place it in the specified directory. 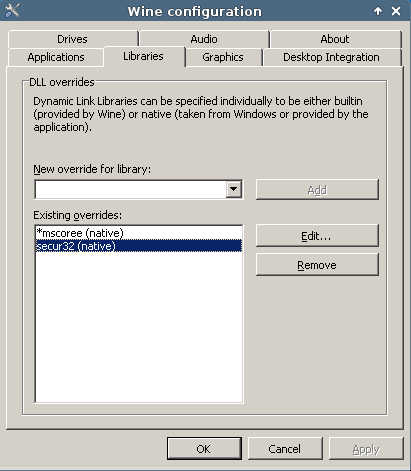 then go to Libraries and add secur32 library in native mode (mscoree should already be there set by winetricks script).